You need to know which eye is your dominant eye (D) and your non-dominant eye (N). Generally, for the majority, if you are right handed your right eye will be dominant. Combining the benefits of a multifocal contact lens and a toric lens for astigmatism, these impressive and innovative contact lenses from CooperVision are able to cater for every prescription. 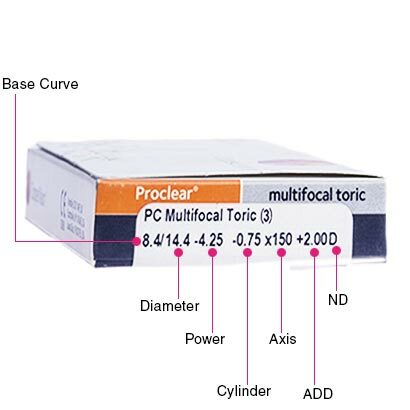 Proclear Multifocal Toric contact lenses offer a highly tailored level of visual correction, delivering a comfortable and reliable wear from morning till night. 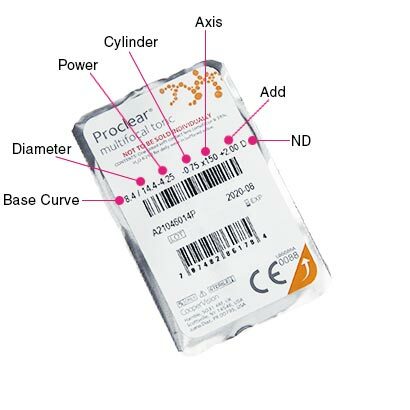 This unique multifocal toric contact lenses have been created with multiple technologies to achieve clear and crisp vision for the wearer, specifically for someone who needs to correct both presbyopia and astigmatism. With Balanced Progressive technology, these contact lenses remain in place on the eye throughout the entire day, delivering sharp and consistent sight, unaffected by blurs, halos or distortions. And, due to their multiple prescription zones, you can also rely on these contact lenses to achieve smooth and easy visual transitioning when viewing objects at all distances. 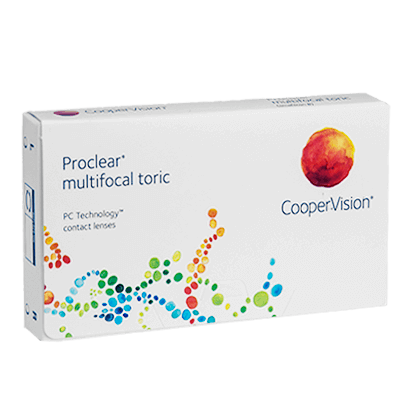 Proclear Multifocal Toric contacts are innovative in the high level of performance they offer, while also delivering a comfortable wear all day long. PC Technology helps to lock moisture into the lens, keeping them moist and hydrating your eyes throughout wear. As a result, eyes will feel refreshed and comfortable while wearing these multifocal toric contact lenses, protected from the onset of dry eye. These monthly contact lenses can be worn for a full day, retaining up to 96% of their moisture after 12 hours of wear, however must be removed and cleaned every night to ensure they maintain their quality. Simply clean and store your Proclear Multifocal Toric contact lenses in contact lens solution overnight to be sure they’re hygienic, safe and comfortable to wear the next morning. At FeelGoodContacts.com, you can find a wide range of contact lens solutions to help look after your lenses, including our best-selling comfi All-in-One Solution.